Indorex Defence is a veterinary flea spray, licensed to kill not only fleas but also house dust mites for up to 2 months after application. It will also prevent the development of flea eggs and larvae for up to 12 months. House dust mites can contribute to allergic diseases in dogs just as much as humans, and will often trigger atopic dermatitis. Using Indorex will kill these mites and help to control them in the home for a full 12 months. However, faeces and body fragments of dust mites can also be potent allergens, so regular vacuuming is also essential. 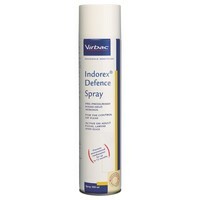 Indorex Defence is an odourless spray that has been approved for amateur domestic use. It will rarely stain materials it is sprayed onto, and will bind to all surfaces in such a way that it will not come off onto the skin. One can is sufficient to cover 79 square metres – the equivalent to an average 3-4 bedroom house. The best household flea spray ever in my opinion with the added bonus of keeping spiders at bay. I bought this last month along with Frontline Plus for my 4 kitty furbabies as I was getting close to a full blown infestation. I treated the cats first and they were sorted within 24 hrs, then I used the spray all around the house. I'd put a sheet of white paper down and a bowl of water in each room and was pretty shocked at how many fleas that were there, I dread to think how many were still in the carpets. Anyway this spray is like magic and within 3 days no more fleas anywhere! Will make sure I'm never without a tin now and loads left after doing my bed 2 house. This was the ONLY product that worked for us. We had an infestation in the living room for the first time in 9 years of owning cats. Cats were banished To non carpeted areas whilst we tried to rid the fleas on them and the room separately. Used flea bombs, supermarket bought sprays and kept flea traps of bowls of soapy water but could not break the cycle. Cats ended up being excluded from the room for almost 2 months and fleas constantly found in the bowl. At my wits end when I bought this and within hours the room was flea free! Will now keep a constant supply of this and there's plenty in one can for our whole 3 bedroom house. Used this for years in the house. With treating the cats with an animal based product and using this in the house and car I have never seen any fleas. 5 star product. Great Product - Does what it says on the tin. Great service from VetUK. I had to contact VETUK as I had to have this before the weekend. Arrived the very next day! Thanks Stephanie for all your help! Really great stuff that saved us from being eaten alive by the darn fleas! Our cat has brought ‘friends’ with her from outdoors and got a dose of Effipro at the local vets which has helped her, but then we, humans at the household, have become the primary flea food! Like many other people we have tried a number of things to get rid of these insects from our home (including stuff like B Martin, obsessive cleaning etc.) and we now wish we saved ourselves time, effort and most of all pain! (we were bitten so viciously that even antihistamine tablets and bite-relief gels/sprays would not help, we’ve been scratching through sleep and have scars left!). With the Indorex it was a case of 2 hours and they were all gone!!! We haven’t seen one since then nor had another bite. The only thing is, we do have 3 bedrooms and used up two 500ml bottles, which still did not cover every room. I don’t know, maybe we have overdone it here and there (everyone who experienced really bad flea invasion understands how eager you are to get rid of the problem and how thorough you are with spraying) and did not appreciate the strength of this spray. Our bedroom was so badly infested we just abandoned it at some point and slept in the attic for a period of time (!) So it is possible that a smaller amount would suffice but we are very happy anyway. With the really affordable prices on the VET UK (especially compared with what we were offered at the vets!) it definitely feels like we did not overpay for the peace we now have. Thank you so much to all people who posted their feedbacks and recommendations! That’s how we found salvation here  PS. Just as a ‘funny’ anecdote- we have found a dead mosquito-like insect in the cap of the spray. The cap was removed just after purchase and left it on the kitchen table overnight, we never sprayed on it or anything- so this tells you how nasty this stuff is for the insects! I have had a flea infestation in my home and after finding this I find this spray really good, seems to do the trick! Really quick delivery. This stuff truly is amazing. I used it as a preventative measure but was amazed to discover that flies cannot live beyond a day in our house now but the most amazing thing of all....it seems to have cured my kids of head lice!! Not seen a single one since spraying!! I have to say Googled and researched what was best products to use for house and this one kept coming up trumps so I have ordered it many times and it's good stuff. After an outbreak of fleas the summer before last, this was the only thing that got rid of them. I now always keep it in and spray the dog and cat bedding after each wash. Coupled with VetUK flea treatments we've been flea free since! Trust me this is brilliant stuff, works instantly, one can is plenty to do a 3 bed semi.If you have fleas in your property then look no further this does the job and does it well. Will definitely make sure a can of it is in the cupboard on standby. I wish had had found this product sooner! We have 3 cats and had been using a more expensive shop bought product that gave everyone a headache as smelt so strong - even days afterwards. Indorex has a slight odour when spraying but it's soon gone and the room is usable quite soon afterwards (ideal for asthmatics). Used long with VetUK Flea Treatment we noticed a vast improvement within a couple of days, we used one and a half cans for a 4 bed house and will be ordering more. Delivery was also very quick and you can leave instructions to leave with a neighbour or safe place if you will be out. The best stuff you'll ever use, really does work - nothing else does. We needed a product that was safe around our grandchildren, safe for my wife (she's asthmatic) and that was effective. Boy did this work! After several weeks of using other shop bought products including drops for the three cats and two dogs, nothing was working. My wife found this site and placed an order which included the Indorex spray. What can I say!? It's amazing stuff and that's for sure. We tried it in the bathroom and a bedroom first as that was two of the main areas we were getting bitten (thanks to the dog) and within a matter of two hours...there was nothing! No fleas crawling over the carpet, none biting our ankles or feet. So we did the rest of the house (in conjunction with pet products on the animals after combing and bathing them all). Totally gobsmacked at how quickly and how effective Indorex Spray is! We bought two cans and as we'd never used it before, maybe went a little overboard but we still have half a can left which we'll be keeping for emergencies however I don't think we're going to need it :) I will be reordering in preparation for next year and I would HIGHLY recommend this to anyone who asks and I will recommend VetUK as the place to get it. Here's to a flea free remainder of summer 2014! Thank you! This flea spray is the business. It's even killing the odd small insect days after application. I've never had a flea problem with the carpets, but then again I've been using Indorex at least once a year for a number of years. Highly recommended, effective product! Indorex is the business. I have used this after a month of spending loads and getting no where with other brands and I seem to finally have conquered the naughty little critters! Don't waste your time with other products this is great! Unbeatable protection at a great price, combined with spot-on treatments (I use Fibrospot) our house stays free of pests all year round. Superb product. We have three cats,and one dog. All the pets are flea treated and all the carpets etc are treated at the same time. This is the best flea treatment for the house that I have found. It works extremely well,and we have never had a problem since using this brand. I wouldn't buy anything else,this is superb! We had a terrible time last summer 2012 with fleas, we tried absolutely everything. We have a cocker spaniel and he was constantly riddled with them despite the treatments. We first purchased Indorex from our vets at a very expensive price of £25.00 per can, spending £50 in all, then found VetUK were the best price. For a 3 bedroom house we used 4 cans but that may have been due to our desperation of fearing it wouldn't work and rid the fleas. I would like to say though we are now in March 2013, and have been flea free since, to me its the best available. Am about to purchase some more now that the spring is setting in just to ensure that we stay flea free. This product is brilliant. I have used this before during a heavy infestation of fleas and it helped considerably in the war against the little critters! I sprayed carpets, rugs (front and back), curtains, bedding, mattresses...pretty much everything fabric. We did not even have a spider in our house, let alone any fleas. It is brilliant and it lasts for ages too once it is in the fabric. Previously, one can was enough to do my 3 up 2 down terraced house twice and I have only just re-ordered (after about 2 years!) becasue I have just handed over the half a can that was left to my mother who has managed to effectively treat a 4 bedroomed semi detached house with half a can. It is truly brilliant and definitely works. Having spent a terrible summer with a really bad flea infestation,I was at my wits end,having tried most of the stuff sold in pet shops I was at a loss of what to try next.After a quick visit to the Vets he recommended me to treat the cats (house cats, they never go outside) with Stronghold and to use Indorex on the house.Armed with this info I got a prescription for the Stronghold from the Vet and bought the Indorex from this site.From experience it take's 3 tins to do a 3 bedroom house,but you have to make sure you spray everything,I cleared one room at a time and sprayed absolutely everywhere,carpets, curtains bedding (animals and human)the mattresses(both sides)basically I just went mad with the stuff.The result ? I've not seen one single flea for the past 3 months,fingers crossed I never do.This stuff really works if applied right and I cannot recommend it enough. It simply is not true that 1 tin of Indorex flea spray is enough to spray a 3 bedroom semi . I bought 6 tins for my 3 bedroom house and still needed Rentokil to get rid of the fleas , this took approx 5-6 weeks . I now keep the dogs outside even though they are flea treated and free from these horrible pests . The treatment used by Rentokil is much better than Indorex but is not available to the general public . It cost me £200 for Renokil plus the Indorex at £10 per tin . I would advise everyone to keep an eye on your pets for fleas and keep them treated as it is a terrible experience to have these monsters in your home and on your furniture , beds, clothing and body . I had problems with fleas all this summer (2012), nothing was shifting them, a lovely guy from Pets at Home gave me VetUK web site & i found this product. Indorex was amazing, we saw a difference in under 2 weeks. We had been infested for over 3 months, we had tried bug bombs other sprays & carpet powders, nothing worked! Indorex is a life saves, my cats are happier and my house is flea free. I ordered 2 cans & still have half a can left! amazing value and a product that actually does what it says on the tin. Next March I will be ordering 2 more to stop another infestation in it's tracks. hi, i have recently moved into a property that had a lot of work needed doing to it, i have two small children so the work started to get me down, the last thing i needed was an infestation of fleas, but it happened. i tried everything to clear them, from shop brand powders and sprays to my local council coming out three times to fumigate my property (for a charge). i have two cats who i use frontline on but even they became infested, they were losing fur and had scabs on there skin. we were all being bit by the fleas. this situation had me round the bend, i felt like it would never end. until i contacted my local vet for advice who suggested indorex spray, they were selling it for £22 per tin, so i was planning to go and buy some that day. i researched online first and am so pleased i did as i came across this site, selling the product for alot cheaper, i made my order and it arrived well within 24 hrs. this is the best thing ive ever bought, since using it i have seen only two fleas, one of which was dead and the other was dying !!!! i sprayed the whole house with this amazing stuff and its worked, i would reccomend anyone with a flea infestation to use this as it really does work, shop brands dont they just kill a few fleas here and there but this stuff just eliminates the whole problem, thank you so VetUK !! Fantastic product. I have 2 Kittens that caught fleas. I was also covered in bites. Tried almost everything to get rid if the fleas from the house. Wish I knew about Indorex before spending a fortune on shop bought products! I put all bedding, towels, clothes, anything material in the washing machine, and dried outside. Then tumble dried just to make sure all the little blighters were dead. Then I hoovered EVERYWHERE!! Straight after hoovering I sprayed the Indorex all over the house. It says on the tin to just spray around the edge of the room ie skirting boards, and any cracks & crevices that the fleas could live in. But I wasn't risking missing any fleas, so I sprayed the entire carpet in all rooms, paying particular attention to the edges. I also sprayed curtains, and mattresses, and the Kittens beds! It's been a week now, and no scratching kittens (after having their second dose of Stronghold) and no new bites on me! I used a tin and half, and I'm off on hol on mon. Going to use the remaining spray before we leave, just to ensure there's no fleas lurking when we return from holiday in 2 weeks!! If you have fleas in your home this is most definitely the product to buy!! Three cats and countless fleas I was being bitten everywhere, couldn't seem to get rid of our infestation and was one step away from calling in the exterminator. I sprayed this on all carpets, furniture and beds infact everywhere, this product was a life saver within 24hrs we saw the difference and I can say within 48hrs no sign of any fleas. Tried shop bought ones but a waste of money Originally bought this product from our veterinary practice at double the price, I always keep a can in the cupboard to kill those that jump from our beloved pets and try to hide in our home. We use this in conjuction with Advantage cat spot-on. Brilliant stuff!! One of our cats brought home a few passengers of adifferent variety of flea that seemed to be resistant to our usual treatments. This stuff is brilliant, problem clearing fast. These fleas are smaller and blacker than the normal variety (chunky, kipper coloured) I've seen but it works briliiantlyon them. This product is excellent, an infestation of fleas can really get you down but Indorex will get the situation under control in record time and keep it that way, thereby making pets and humans lives much more comfortable. Its fantastic value for money considering its coverage and the length of time it lasts in your home and it doesn't produce choking fumes while spraying or a lingering smell. Have used this product for years and as a owner of 15 cats, i make sure they are healthy and comfy as we are in their home... we have never seen any fleas since using this product.. on a plus side this is the best website for any pet products, the prices are fantastic and the service is awesome.... Use it, you will not be dissapointed! Our vet recommended this for house dust mites. Our dog had developed an expensive allergy to them and after one full house spray his symptoms had gone (constant scratching and nibbling his paws until they bled). I can't rate this spray highly enough. I am using this product because it kills dust mites, my cat has a allergy to any form of mite, dust mites, storage mites, etc. My vet told me to use this every month for 3 months and then every other month for a couple of months, to see what the difference is in our cat. Within a month, I can see the difference, her coat is starting to grow back and she is not scratching so much. Great stuff and cheaper than our vets. This product worked wonders, much better than the one our vet recommended. We had a major flea problem in our house, but this solved it with one application! The product the vet recommended didn't work after 5 applications. Would highly recommend this product! We bought this product after months of trying to rid our home of fleas,other flea sprays,smoke bombs etc just did not work.this product was delivered the next day and it has got rid of all the fleas.we are ordering another can to keep as a spare because it is so good.it does exactly what it says on the tin!! want a fast,effective treatment for flea infestations then 'indorex' is the product you need!!! Excellent product. We have 3 cats and wasted precious time using a Bob Martin's spot on product bought off the supermarket and it didn't work at all, so we ended up with a flea infestation! Each day was worse until we realised it had only wasted time and money and created a really big problem, we might have millions of fleas for all we knew, we also got several bites. We got frontline and also used this spray everywhere, even the car. I actually sprayed everywhere again in a couple weeks just to make sure. It does go a long way, but if you have old wooden floors with wide gaps as we do, you might need an extra can. After all the bites and itching I was very happy to see them dead on the floors. Now it's been a week till I saw the last one and our cats are not going crazy anymore. Not completely odourless but almost, it doesn't make your place stink. I'm asthmatic and have also noticed that I sleep better now, maybe because it also killed all the dust mites. We are getting another can for our holidays, just to make sure that we can forget about these awful little things. Highly recommended, it really works, but use it with frontline so your pets are also treated. Cheapest anywhere and next day delivery. VetUK is definitely on my shopping list for future purchases. Amazing stuff. We had tried everything to get rid of a flea infestation; steaming the carpets, flea powders etc etc. Then I bought two cans of Indorex, used them and no more fleas. Amazing stuff. Very simple too. So much better than steaming the carpets in the middle of July! Highly recommended. It's the only thing that worked for me. This product works and is extremely effective. We recently had a very bad flea problem. Nothing bought from the supermarket would get rid of the little pests. In desperation we bought a couple of cans of this and the fleas were gone immediately after application. A little goes a long way, so we still have one and a half cans left. Can't recommend this product highly enough. Very pleased and impressed with it. When i moved to my current address 3 and a half years ago it soon became apparent the house was jumping with rabbit fleas which my dog became allergic to we tried every thing on the market from sprays to bombs nothing worked even replacing the carpets then we found this amazing it even kills ants,flies,any household bugs they come in and soon are gone , even better the price on this site is far cheaper than anywhere else. I have bought several cans of this - and I found it was brilliant. I had indoor cats; who had never had fleas. BUT there was a stary which would sit outside the kitchen door at night. It's fleas; came into the house; and both the cats and the house were hopping. I tried tons of sprays at pet shops; and grocery shops - with no effect. Then I used this - and problem solved!! As long as I have cats - I will never be without this! It does last a year! You won't be dissappointed! I was dreading spraying all of my home with this product. I was totally delighted how easy it was to use. I thought the house would smell for days..with windows open the air was clear within half an hour. There was hardly any smell to speak of. I thought it may affect me in some way but I am very happy to not hesitate to use it again. I am about to shampoo the carpets so am purchasing another can to ensure I am free of any fleas or eggs again. It's a very good price we get on this site and the spray is certainly enough to cover the whole of the house and more. A very effective product.